A photo from the set of Dark Knight Rises might reveal an important, life-rejuvenating plot point. Christoper Nolan has been very secretive about the plot of Dark Knight Rises. We know about some of the film's cast, including Tom Hardy as Bane and Anne Hathaway as Selina Kyle (who may or may not don her Catwoman costume), Marion Cotillard and Joseph Gordon-Levitt in unassuming roles, Josh Pence as young Ra's al Ghul, and that's about it. However, now that shooting is getting underway, a photo from the set in India may have revealed a plot device related to Ra's al Ghul. In the Batman comic books, Ra's al Ghul stays eternally young and healthy through a pool of mystical chemicals called the Lazarus Pit. 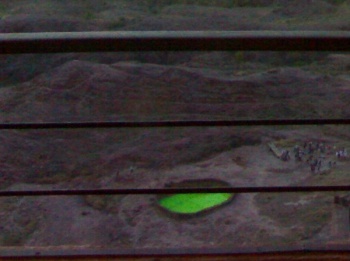 In the leaked photo, a large hole has been dug in the ground and green-screened so that effects can be added after filming. With the confirmation of a young Ra's al Ghul in Dark Knight Rises, it's entirely possible that this hole is a Lazarus Pit. While the Lazarus Pit keeps whoever takes a dip in it alive, it also drives them mad. Nolan introduced Ra's al Ghul in Batman Begins as a pretty crazy guy, what with him wanting to kill a mass of people to save the world and all. Though the idea of a Lazarus Pit seems a little out of Nolan's range, who previously used no "superpowers" in his Batman films, it still could fit from a scientific angle. Evidently, there's a mention of "The Pit" in Ra's al Ghul's journal from the Batman Begins novel, lending more credence to the theory here. This might mean that the young Ra's al Ghul being played by Pence will actually be the present Ra's al Ghul rather than a version shown in flashbacks, perhaps being forced back into the Lazarus Pit to heal injuries sustained in Batman Begins. Of course, this is all speculation, but the coincidence of green-screened pit dug in the middle of India and the casting of a young Ra's al Ghul in Dark Knight Rises isn't exactly something that can be ignored.